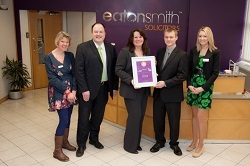 We are delighted to have been named Business of the Month for February in the awards run jointly by the Mid Yorkshire Chamber of Commerce, UKTI and law firm, Eaton Smith. The photo left to right features: Annie Bradley, UKTI; Danny McAllister, Simpson Wood; Alison Palmer, Eaton Smith; Simon Cook, Calder Security Ltd; Ellie Lyon, MYCCI. For further information about the awards contact Ian Greenwood at Eaton Smith. News of previous winners can be found on the Mid Yorkshire Chamber of Commerce website. previous Take a Fresh Look at our Website!